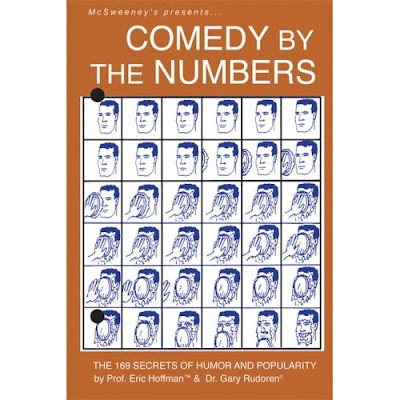 I just started reading a great new book put out by the fine people at McSweeney's entitled COMEDY BY THE NUMBERS. It's a VERY tongue-in-cheek book, not intended for children, that is not only an excellent introduction for those just starting out but also very entertaining for those seasoned comedy performers and fans. 10 years ago this summer I was fortunate enough to fulfill a lifelong dream and was accepted into what was to be the final class of the Ringling Bros. and Barnum & Bailey Clown College. 10 later I have spent the year thus far touring arenas around the country as a professional circus clown, had the honor of performing alongside 49 of the best clown and comedy/variety performers in the world at the hugely successful International Clown Festival in Luizhou, China and just spent a week with some great friends, both old and new, teaching circus and clowning skills to 27 extraordinary kids at Michael Rosman's Circus Camp. Please click the title of this post to view photos from (the ones titled RPCS Day 1,2,3 & 4 are from last week) Michael Rosman's Circus Camp featuring photos of Mark Lohr and I teaching all of the classic clowning fundamentals: funny walks, funny faces, naps, slaps, falls, kicks, foot stomps, takes, double takes, spit takes, water spitting and pie throwing. MICHAEL ROSMAN: Set Your VCRs, DVRs and Whatnot! 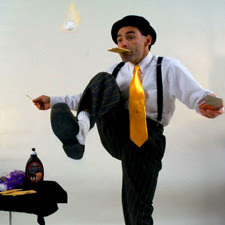 Ringling Clown College graduate, former Beatty-Cole Circus clown and creator of Motionfest and Minifest, Michael Rosman will perform his world famous "Flaming S'Mores" trick this evening on the Tonight Show with Jay Leno. Some doughy, middle-aged townie loser bothering John Ringling North II, new owner and producer of the Kelly-Miller Circus during a visit and performance by students from Michael Rosman's Circus Camp last Wednesday night. Thanks go out to Mr. North, Jim Royal and John Moss for a wonderful experience that the kids will never forget. For more on the camp, please click the title of this post. 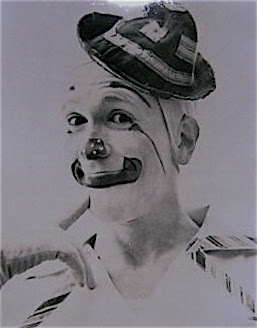 The greatest of all the "cookhouse clowns", Billy McCabe made the jump from the kitchen to the Alley and back again a few times during his long career, doing both to great acclaim. 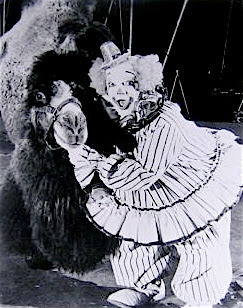 Billy was a longtime fixture in the Alleys of the Beatty-Cole and Vargas shows. Very similar to the one done by Caesar during his time on Cirque de la Mer at SeaWorld in Orlando, Fl and the one done on Billy Smart's Circus that I posted back in March, here is Don Christian with an audience participation version of the classic Boxing Gag. 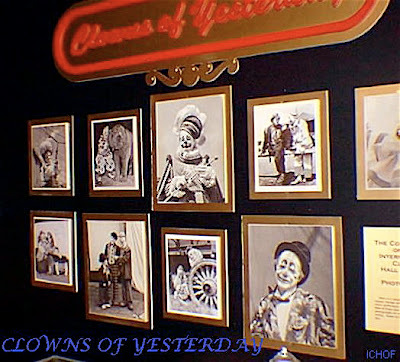 These are the Clown Alley Walkarounds from the 131st Edition of the while the show was on tour from 2001-2002. This was taped in Salt Lake City Utah. A photo display which looks to have been designed by Mark Renfro. 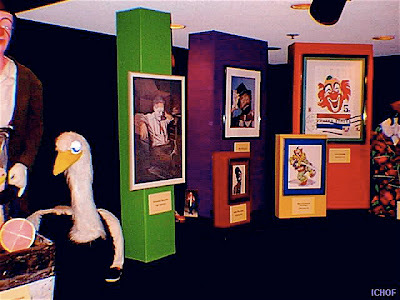 Note the life-sized Bumpsy Anthony at the extreme left, followed by Mark Anthony's squirting grapefruit and ostrich walkarounds, what looks to be a Jim Howle painting of Frankie Saluto, a Red Skelton painting of his Freddie the Freeloader character, a blow-up of Lou Jacobs' 1966 postage stamp and an artist's rendering of Howdy Doody's pal Clarabell (who was first portrayed on the show by future Captain Kangaroo, Bob Keeshan). 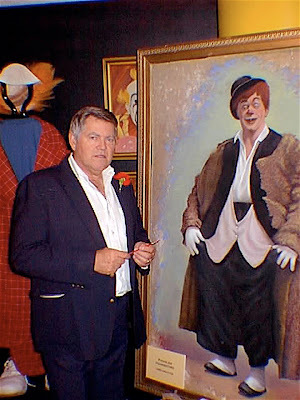 Former Ringling clown, Clown College graduate and master painter Jim Howle with a portrait of Poodles Hanneford. A painting of Chester Sherman hangs in the background. The International Clown Hall of Fame is located at the Wisconsin State Fair Park's Tommy Thompson Youth Center 640 S. 84th Street (Gate 5) West Allis, WI 53214 and their phone number is 414-290-0105. The ICHOF's new directors Terri Hall and Bryan Peiss (sp?) 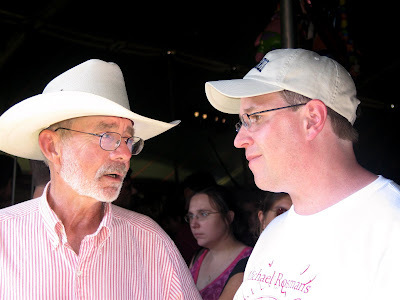 assure me that, after a transitional period, the International Clown Hall of Fame is open for business and they look forward to seeing you all this summer! 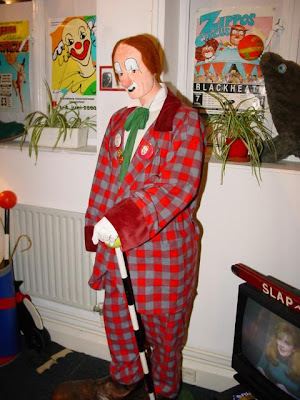 CLOWNS GALLERY AND MUSEUM: All Saints Centre, Haggerston Road, Hackney. The Clowns Gallery and Museum is open for viewing and educational study from 12 Noon on the first Friday of every month. Visitors to the Museum are warmly welcomed and parties of visitors can be hosted on days other than the first Fridays by prior arrangement with the Museum manager. Maximum size of parties not to exceed 20 persons, please. 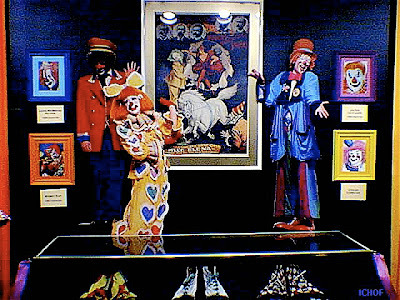 The Clowns Gallery and Museum is a private museum that is unique in the British Isles. 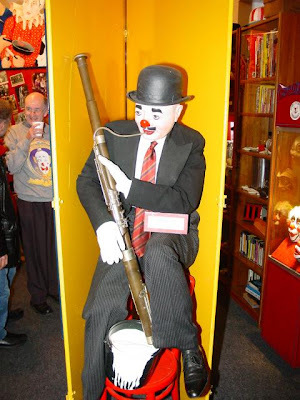 It was founded in 1960 by Clowns International to house a display of pictures and artifacts relating to clowning and its history from earliest times. Now it has expanded to include props, costumes and a plethora of clown related items plus a literary Archive. It has been described as a jewel box and the next best thing to visiting the circus. A prime exhibit is the famous collection of painted eggs which record the facial make up of hundreds of clowns thus registering the designs in Britain.